With the end of the recording sessions in sight for DEAD TROOPER, front man and guitarist Morten Müller revealed a little information about what to expect from the Norwegian Thrashers sophomore full-length album. “We’re recording 13 tracks, and we expect to use 9 of those on the album, but obviously we’ll make our minds up exactly how many, and which ones, once we’ve finished the whole process. We’ve taken a much more organic approach than the one we took with our first full-length album “Cynicist”, and we’re aiming at injecting a lot more of the energy that you find in our live performances into the new one”. 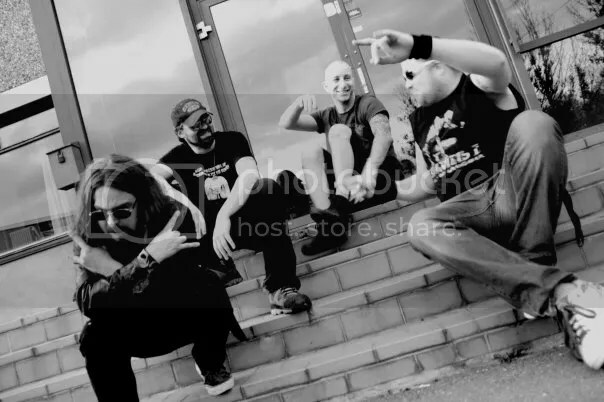 Formed in 2002 in Oslo, by Morten Müller and Birger Larsen together with then members Are Sorknes and Andreas Paulsen, DEAD TROOPER has since released two EPs as well as the debut album “Cynicist” which appeared in 2009, and has regularly played live, bringing their brand of what the band describes as “groovy, aggressive thrash metal” not only to audiences in their native Norway but also as far afield as South America. “There was a point”, says Müller, “when we had gone through the usual line up changes that bands go through in their attempt to find the perfect line up, when I was almost tempted to wind the whole thing up, but then in 2008 the most incredible drummer in the shape of Jon Eirik Bokn came into the band’s life. His skills are matched by his larger than life personality, and his arrival brought a whole new enthusiasm and creativity to DEAD TROOPER. He was followed into the band by 1349, DEN SAAKALDTE and PANTHEON I bass player Tor R. Stavenes, who brought his own unique take on things, and we knew at that point that we had a good mix. We are very happy to say that this enthusiasm and creativity has remained unabated since their arrival”.